Laser noises always help you win battles. Yo, East Coast Posse! I'm here in NYC for the crazy CBS ridiculousness, so while I'm in the neighborhood I figured I'd stop by Bootie NYC for a guest DJ set. 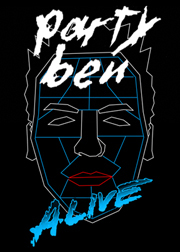 I'll be reprising the Daft Punk-inspired Party Ben Alive all-video set that San Franciscans saw in January and Los Angelenos were treated to in March, and this will likely be the last time I do it, so call your friends, cancel your appointments and come on out. 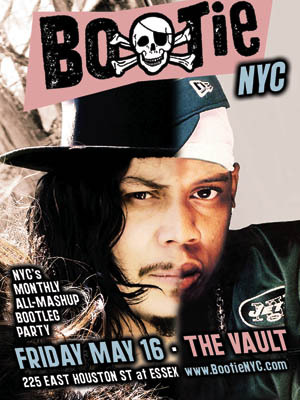 Bootie NYC happens at the Vault, 225 E Houston at Essex, F/V to 2nd Avenue, this Friday 5/16. In nutty British festival news, I hear a lot about peopleplaying my tracks at random events or clubs, but this is amusing enough I figure it's worth making note of. BBC Radio 1 just held its "Big Weekend" music festival, featuring Madonna and stuff, but over on the dance stage, you could witness Radio 1 personalities Chris Moyles and Judge Jules DJing together in some sort of "battle" set. This battle took the form of them playing one track at a time and then getting on the mic to declare their superiority, much to the crowd's amusement. Anyway, Moyles' first choice was none other than "Galvanize the Empire," which I believe he's been known to spin on his show. It's hard to hear exactly from the crowd noise whether they appreciated it or not, but Moyles announced "I won" at the en of it. It was apparently broadcast on Radio 1 as part of a Big Weekend highlights reel at about 6:45am Saturday 5/10; listen to the segment below, or listen online to all the Big Weekend excitement here. And thanks Moylesy! Hey look I'm riding corporate dime all the way to a Bootie NY guest appearance! Featuring Adrian & Mysterious D par usual! $5 before midnight with RSVP!